All exposed parts of the unit are of S.S, hard chromed or SS cladded to ensure long life and resistance against corrosion. Adjustable Conveyor Height to align with other machine of the line. Minimum changeover time is required from one size of container or label to another. These self-aligning bearings help in quick assemble during periodical maintenance of the unit. They also allow more flexibility in maintaining tolerances. No container, No label, an electrical sensing device avoids wastage of labels; it also helps in keeping the unit neat & clean. Suitable for overlap labeling and flag type labeling where the length of label is more than the circumference of container. A highly efficient vacuum pump develops sufficient vacuum to hold labels big or small on the pick-up Cylinder. Complete protection of the motors is ensured by the contactors and relays of appropriate ratings. 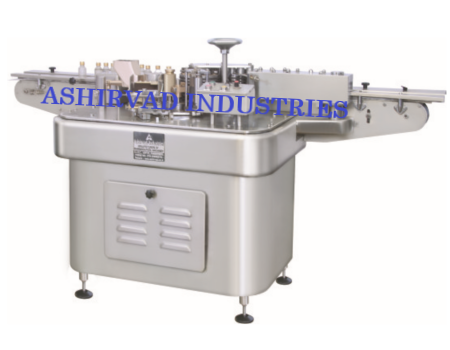 Labeling Capacity 40 to 120 Bottles / min. (Depend on Machine Model). Power Characteristics 440 VOLTS. 3 Phase (4 Wire System), AC 50 Hz. Main Motor 0.75 HP/ 415 Volts / 50 Hz. Vacuum Pump 0.5 HP/ 415 Volts / 50 Hz. Label Height 16 mm to 90 mm. Label Length 20 mm to 220 mm. Round Bottle Dia 16 mm to 90 mm.